See how it is blurred out? I hate when they make nonmember items premium! Well that is pathetic of Fantage. But I thought about it.... we are dealing with Fantage here. That is unfair! But the members paid... So they deserve better things. wat. i thought they were always prem. They weren't. They used to be non. That is plain old stupid and dumb, you payef for them, now they are member?! 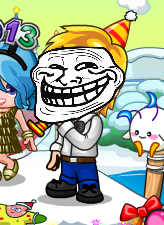 UMM FANTAGE THAT'S JUST REALLY TROLL LIKE OF YOU. This happened to me too. But I sent an email to their support explaining what happened and they apologized and refunded me the stars for the glasses! So you should email them too and get your stars back. Sarahgirl, stay on topic please. Infraction given. I wasted my starz for that!! Well, This is unfair but thats what the admin do so we cant do any. Well, Fantage also has to earn money someway. And that is to make more people pay for membership. Yeah, Because if theirs no Membership then the fantage wont stay long. They actually always were prem only but there was a cheat if u have enough stars u can buy it if u r non. It has nothing to do with membership. I wasted a month getting over 1000 stars to buy somthing I couldn't wear!!! you could have this tips so that you wont waste your month just to get 1,000 star. yeah, it made me so mad. i bought is and was like OMG A VIRTUOUS NON MEMBER ITEM!!! and two days late i was like I HATE EVERYTHING! Please do not bump topics that haven't been posted on for three weeks+. Topic locked and infraction given.